for the MetaTrader4 Trading Platform! Renko bar charts were created by the Japanese, as were candlestick charts, sushi, and very reliable cars. While candlestick charts show price movement within a specific period of time, Renko bars completely ignore time and only record price movement. This filters out a ton of market noise and really cleans up the charts because moves smaller than your bars are simply not recorded. If price moves up a minimum of X pips, it creates a new Bullish bar. 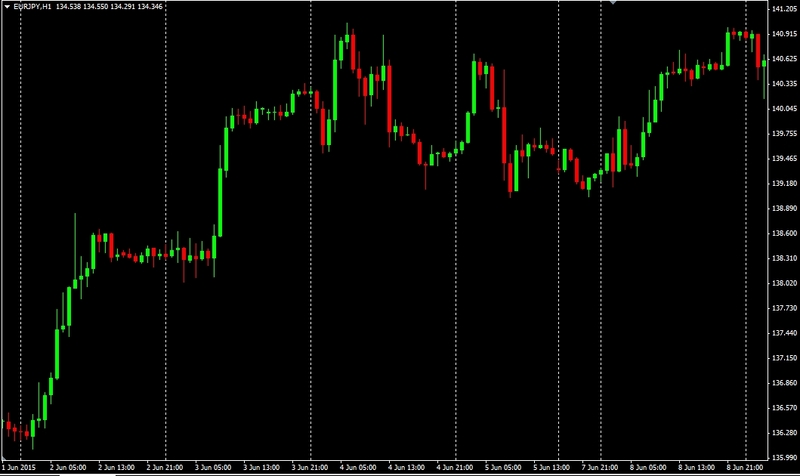 If price moves down X pips, it creates a bearish bar. To create a reversal bar, the most common setting is to require a move DOUBLE the size of the previous bar that was in the opposite direction. This helps prevent false reverse signals so you can hold a position in a trend longer. Renko bars have an uncanny ability to create order out of chaotic conditions and the larger your bars, the more it cleans up the charts. Renko Bars are created from 1-minute candlesticks for the highest level of price/time accuracy. (See #15 below to import multiple years of 1 Minute data). Open a 1-minute candlestick chart of your desired currency pair. In these examples, we'll use EUR/JPY. 1. Open your MetaTrader4 Platform and click File then New Chart. 2. 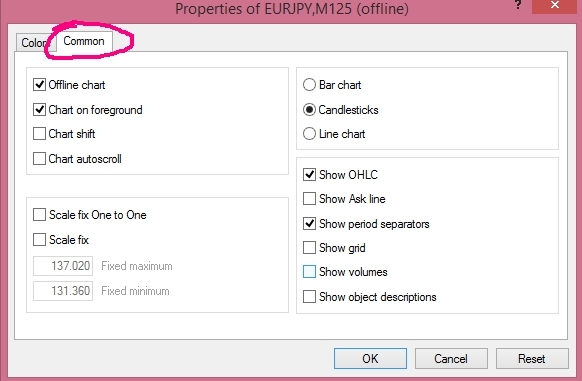 A 1-hour chart will open by default so click M1 at the top of your chart to get 1 minute candlesticks. NOTE: To get the most 1-minute candlesticks on your chart, click on the chart then press and hold down the "Home" key on your keyboard. You should be able to load 2-3 months of 1-minute data, depending on your broker. In Step #15 below, I'll show you how to download up to 10 years of 1 minute data. 3. 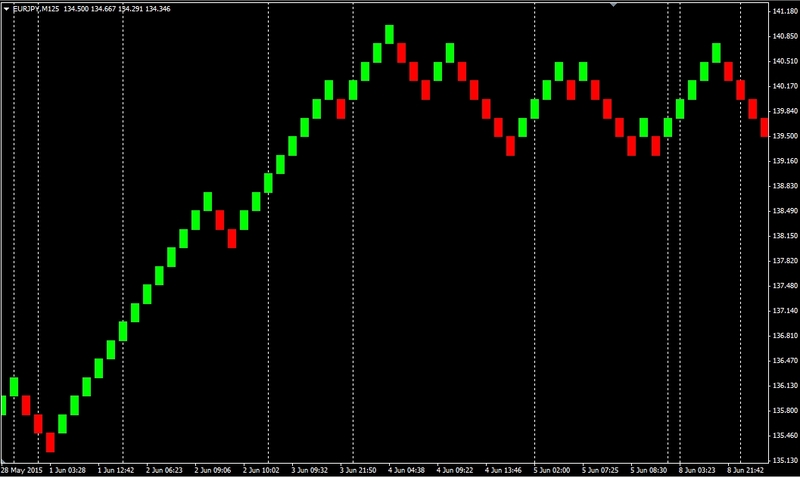 Attach the Renko script to your 1 Minute chart. 4. In the Common tab, use these settings for both Live Trading and Back-Testing. On the INPUTS tab: The image below is self-explanatory except for the Time Frame setting and it's critical that you understand this and get it right. To operate as a live chart FOR LIVE TRADING, you must choose a non-standard (non supported) time frame so it does not conflict with one of the supported candlestick time frames, so DO NOT use: 1, 5, 15, 30, 60 (1 hour), 240 (4 hours), or 1440 (1 day). What I normally do is add the number 1 to the number of pips that make up a Renko bar. For example, if I'm using 15 pip Renko bars, then I would enter 115 for the time frame because I can't use the number 15. But by using 115 instead, I can tell at a glance that it's a 15-pip Renko bar chart and yet, it does not conflict with a supported 15 minute chart. FOR BACK-TESTING, you will need to do the opposite because the back-testing program does not recognize non-supported time frames. Therefore, choose any supported time frame in minutes, such as 1, 5, 15, 30, 60 (1 hour), 240 (4 hours), or 1440 (1 day). It will create a Renko chart labeled as your chosen time frames and then you'll be able to attach an EA to it and perform back-tests. But also be sure to have the "Backtestmode" setting as True or it will not back-test properly. 6. Optional: You can save these settings by clicking SAVE in the previous step. The window below will appear. Name the settings based on the size Renko bars and whether it's for Backtesting or Live Trading. You can see in my screenshot below that I have settings for many different sized bars. Some are for back-testing and I normally enable Tails for live trading. Saving these settings makes it quick & easy to load the appropriate settings in the future. After your settings are saved, click OK on the previous window to build your Renko chart. 7. Your Renko Chart details will be displayed in the top left corner of the chart the script is attached to (it should always be a 1 Minute chart). 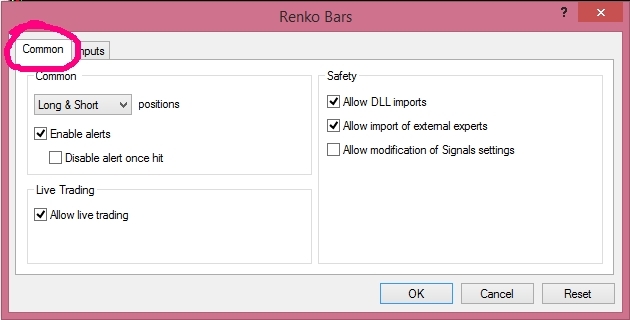 IMPORTANT: If this area ever says "Renko bars finished", that means the Renko script has been disabled and must be reattached to continue building bars in live trading. 10. Your RENKO Chart will open. By default, it will open with all green bars so if you want to make it look like mine, right click on the chart and select Properties at the bottom of the popup window. 11. Here, you'll be able to customize the colors and background of your chart. Copy these settings if you want to make it look like mine. 13. Your RENKO Chart is now ready for LIVE Trading. attaching your Expert Advisor to your chart. 14. To BACK-TEST on your Renko chart, choose a supported time-frame in step #5 above so the Strategy Tester program will recognize the chart. Then CLICK HERE to see the Back-Testing Tutorial. NOTE: To back-test a Renko chart, you should disconnect from the internet immediately after opening your offline Renko chart. Otherwise, the software will begin to update the candlesticks and convert your Renko bars to standard candlesticks. This is because Renko charts for back-testing run on supported time frames and the MT4 platform doesn't know the difference between a Renko Chart and a candlestick chart. 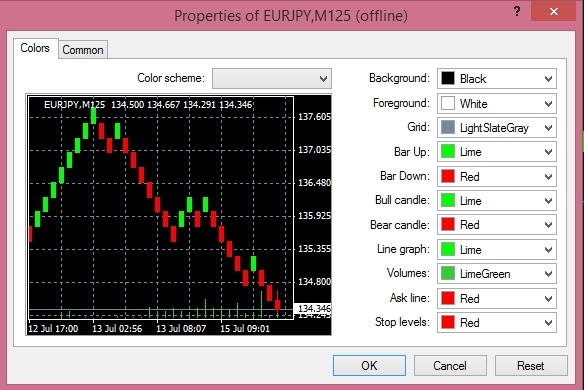 It identifies the renko bars as errors in the price feed and attempts to correct them. a. At the link above, choose the currency pair and year of data you want to import and save the .csv file to your hard drive. b. In your MT4, open Tools > History Center and choose the matching currency pair and 1 Minute time frame. c. Click "Import" and Browse. Find the 1 Minute .csv file on your computer. If the default import settings match your csv file, then the data will appear legible in the Import Display popup window. If the data looks scrambled and not separated properly, then adjust the Separator settings until the data looks organized and click "OK". d. If the settings are correct, it will load the 1 Minute data into the primary display window. The time stamp on the 1 minute bars will place it in chronological order by default. e. If you end up with a data gap, it will appear as multiple bars with huge wicks or tails on your charts but this can also occur in the case of very large 1 minute bars. You can fill most data gaps by downloading the missing months from the same website. 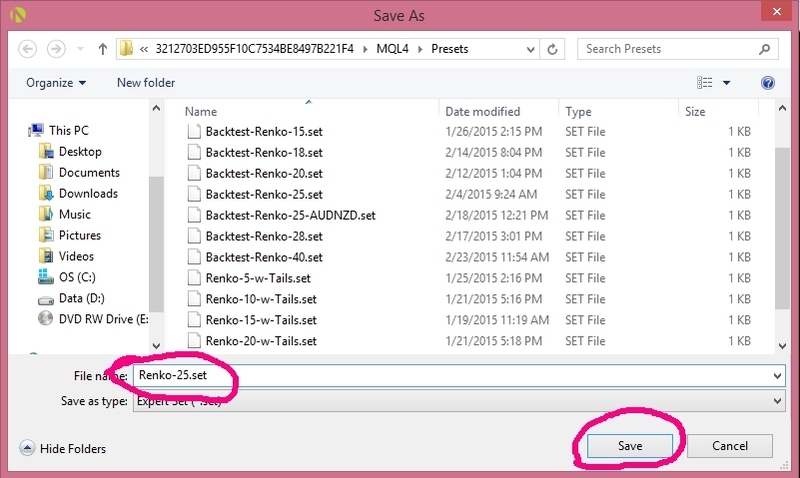 f. If you're unable to patch gaps in your data, it's best to delete your 1 Minute data completely and start over. To do so, close any open 1 Minute charts for that currency pair. Open your MT4 Data Folder (click File/Open Data Folder), open your History folder and delete the 1M .hst file for that currency pair. Then close and reopen your MT4 platform. You will have a clean slate for that currency pair's 1 Minute data. Repeat the steps above but import as much data as possible up to the current date from the .csv file up to at least the last 30 days. Your live MT4 charts will fill in the rest.